The indicator species of the Mojave. It is the icon of the Mojave symbolizing all that is the Mojave. 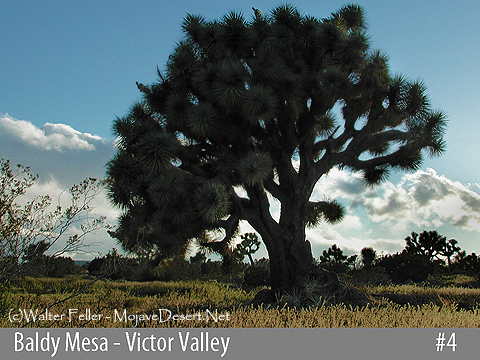 The Mojave River bisects the valley with High Desert Plains and Hills (Subsection 322Ag) to the west and Lucerne - Johnson Valleys and Hills (Subsection 322An) to the east. This section is on steep mountains, moderately steep hills, very gently to moderately sloping pediments and alluvial fans, and nearly level basin floor and dry lake bed. Mainly of Mesozoic granitic rocks and Quaternary alluvium. Eolian sand deposits are common. The elevation range is mostly from about 2000 to 3000 ft. 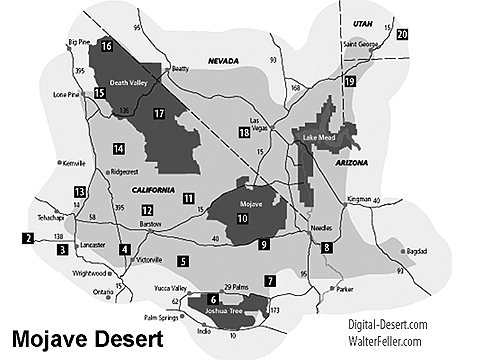 The predominant natural plant community is Creosote bush series on hills, pediments, and fans. Joshua tree series is common on pediments and fans. Black bush series occurs on the higher mountains. Mixed saltbush series is common on basin floor and Iodine bush series and Saltgrass series are present on wet basin-fill and lacustrine deposits.